For those waiting patiently for the Moto X to arrive on Verizon, your time has come. 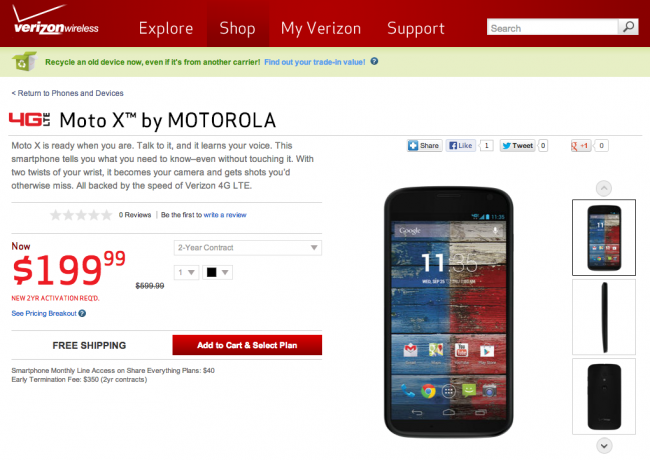 Motorola’s 2013 flagship can now be purchased through Big Red’s website for $199 on-contract in either black or white. If you’d like to go off-contract and pay full retail, the device will run you $599. Yes, that is $20 higher than the $579 off-contract price that AT&T is currently selling the phone at. The device is only available online for the time being, with in-store stock arriving in the coming weeks. We’ve already reviewed the Moto X on Verizon, be sure to check it out if you haven’t. Note: The VERIZON30 coupon code still appears to work if you’d like to save 30%. Tip: If you are buying at full retail, use the Iconic Portal.